Used foam background covered in black fabric. 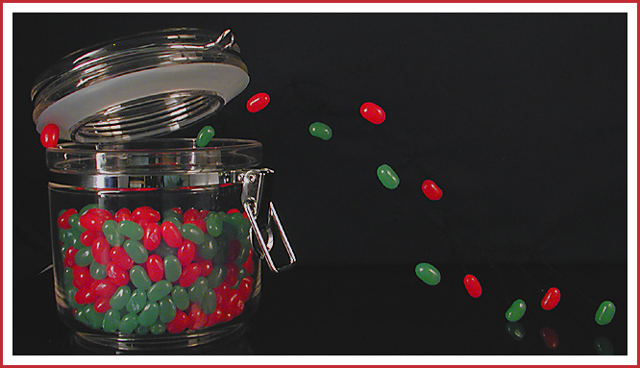 Jelly Beans were suspended by small steel rods projecting from the foam. I am new to photography. I love how all of you do these kind of Pictures. I am truly intrigued, so I am going to try new ideas like all of you. Greets from the Critque Club! First off let me say that I think this photo shows great imagination and creativity. Well done in that regards! Now, to the meat and potatoes of the critique. The biggest thing that bugs me about this photo is that the colours feel very dull. The reds and greens don't pop out of the picture like I expect them to. The reflections are well controlled on the glass jar, but a bit overwhelming on the silver band. Other than those couple nitpicks, I think this a well executed shot. Good job and good luck in future challenges! A great imagination, good techs, and some positive planning, make for a rewarding entry. Congratulations! Great setup, well composed. Congrats on the ribbon! two challenges enter and won on the second try ... Well done and congratulations. I sure you will be winning a lot more. congrats on your ribbon! very fun shot. Congratulations on your ribbon! Fun and funky shot! Now that's a top-heavy score list. Alright Wayne, congrats on your first ribbon. Great photo! WTF!?! Can't wait to see if they are glued on the bg or what! :) Excellent, intriguing shot (good idea on the administrator's note) 10. Fun, unique idea! Well done. LOL!!! Now how did you accomplish that? I've examined this so many times and can't figure it out. Wow, I'm curious to see how you set this up. Very funny. PIty the greens weren't as bright as the red as the contrast of the complementary colours would have had a bit more impact, but this is a terrific way to hit the topic and provide a fun picture. What a fun photo! Great idea well done. Very cool effect and well done as well. I'm thinking this is a shot upward through a piece of glass that the jar and beans are laying on? One improvement might be to make the beans all upright, or at least like the ones on the far right. Great job! 8. Very cool. A touch more light would have really help the jellybeans to stand out, I think. Nice and unique take on the challenge. Seems as if the contrast could be boosted just a tad to bring the colors out just a little more. Great idea and great set-up. It had to have taken you quite awhile to set this up. 8 Good luck in the challenge. Clever... how did you do it? oh I love it! This is hilarious, and brilliantly executed. I hope you have shared how you managed it in your photographer's notes, and if not, I hope you will, its absolutely awesome! :) Those jellybeans have got a lot of character, and they're brave too. Good story here with that red one holding open the lid. Great stuff! good drama in the shot with the implied motion. The colours seem really flat and low contrast though, which doesn't help. Good thing you got validated! I really like it, but I wish the green was brighter. Maybe if you had done it on a white background instead of black, but that probably would have messed up how you did this, huh? Still, I'm giving you a 9 because it's cool. cute shot..let me see if I can figure it out...picture taken of the jar first. Then jelly beans on glass over the picture? hmmmm...am I right? Anyway, very original. would have liked the colors in the jar a drop brighter. I would have darkened the black also. Proudly hosted by Sargasso Networks. Current Server Time: 04/20/2019 02:27:17 AM EDT.